If you consider where to spend your vacation, Northern Cyprus is just a perfect holiday destination for you. Visit Northern Cyprus and discover a brilliant piece of jewel flipped in the eastern Mediterranean. Once you spend your holiday in North Cyprus, you will want to come again even if the thermometer burns in the summer weather and the temperature reaches 40 degrees and your clothes stick to your body. What you can look forward to spending your dream holiday in Northern Cyprus is dozens of fine sandy and not crowded beaches and beautiful unspoilt coastal landscape since the country is relatively undeveloped and untouched by the mass tourism. Those of you who have not been to North Cyprus yet, will sure like this wonderful country, rich in history, traditions and culture. Although reaching North Cyprus is not that easy as flying to Paris or London, you can book a cheap flight to North Cyprus via Turkey to North Cyprus Ercan Airport, or via South Cyprus to Larnaca or Paphos Airport and then cross over to North Cyprus. Northern Cyprus offers you a rich variety of holiday accommodation. With summer holiday in your mind your idea of preferred accommodation will be most probably a hotel, perfectly located in the very distance to the North Cyprus beach. In North Cyprus you will find many different hotels. Not only you can book a hotel close to the beach and with outstanding amenities, there are many holiday villages and holiday resorts nestled under the Kyrenia Mountains or in the area close to the Mediterranean Sea. These Northern Cyprus hotels are larger in size and preferred by tour groups or larger groups of friends or families with children. There are some hotels, club hotels, in North Cyprus specializing in holiday activities, while in other hotels in TRNC you can find a casino. So if you are a casino player, North Cyprus is the right place for you as there are many casino hotels in Northern Cyprus. Northern Cyprus hotels are of various rates, offering a number of services and ranging from small family hotels to luxurious 5 star hotels. Surrounded by beautiful beaches, and equipped with swimming pools or water parks, they provide wonderful conditions for water sports such as scuba diving or yachting. Most of the hotels are located in the Kyrenia district, with North Cyprus Kyrenia town being paramount in North Cyprus tourist and holiday destinations. Either you travel west to Lapta and Alsancak or to the east to Catalkoy and further to Esentepe both the directions from North Cyprus Kyrenia are studded with number of holiday accommodation. If you head east towards Famagusta, the coast shape of which resembles an armpit, Famagusta also offers good holiday hotels with water pools and sandy beaches. Karpaz region is now being involved in ongoing construction projects. If you are looking for quiet sandy beach, Karpaz is the place to go to spend your North Cyprus Holidays. 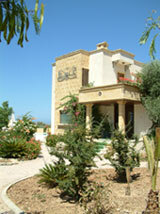 Hotels in Nicosia although in Cyprus outback will meet the demands of any businessman or visitor. Like in many popular holiday destinations, in North Cyprus alike you will have the opportunity to choose from different types of holiday accommodation. Either you opt for a hotel suite, apartment, bungalow, private self-catering villa, or other kind of holiday homes, the services of each type will surely meet your requirements and desires. North Cyprus Holiday rentals, among which holiday villas and holiday apartments can be rented, while your holiday in North Cyprus. These are normally provided by North Cyprus real estate agents who will show you their property in North Cyprus portfolio. Varied in price and style, holiday villas enable you prolong your stay in TRNC and are often fancy equipped. Usually they are situated off the Northern Cyprus main roads. When you come to Cyprus Island during summer months, you will be enjoying cloudless sky and plenty of hot days. For splashing in the waves and lying on a soft sandy beach this is ideal weather. With this hot weather you can practice different kinds of summer sports and entertainment, not mentioning disco, open-air parties and nightlife. During those hot summer days a glass of beer in a bar or a café will do you good, and you definitely cannot omit traditional Turkish coffee and Turkish Cypriot cuisine at local North Cyprus restaurants. In your leisure you can go sightseeing. You will be amazed at some of the majestic sites of North Cyprus that have great piece of Cyprus history hidden within. Roman columns, medieval castles, theatres, Gothic cathedrals converted into mosques and many other sites make Northern Cyprus indeed resemble an open-air historical museum. You can admire the sights at your will or there will always be possibility to join guided tours or excursions. But to have a really nice holiday in North Cyprus you should set sails for a boat trip and let the waves float you along. If you really want to explore beauty of North Cyprus, car hire is inevitably needed. Set off on a journey and you will have freedom to plan your trip around the country and with quality services that car rental companies in North Cyprus have to offer. You can choose a vehicle easily also via online North Cyprus car hire reservation system.